Alex Napier of the Toronto based Island School group came to Someone in the summer of 2010 with an idea of how she wanted her current production's promotional poster to work for her. She needed a large print poster that would stand out as something completely unusual, contemporary, upbeat and – most important – it must cut through the chaos of downtown street life and make a visually powerful statement. Alex knew something of letterpress and had decided already that the texture and ambiance delivered via the recently popularized medium would both suit her production and be attractive to the precise audience she felt would be most interested in her work. 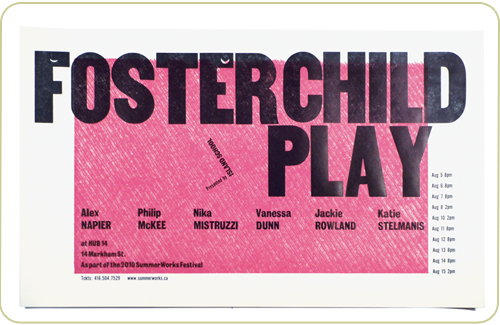 Foster Child Play was an amazing success, and the posters still get comments! Key to the visibility and attitude of the poster is a large ground printed from a piece of cardboard cut on an angle, mounted directly onto the bed plate in the press and printed, as if it was a polymer or metal plate. The texture in the pink block is created by the wavy inside structure of the cardboard which at once makes the work seem hand made and also industrial or mechanical. Largest wood type spells out the headline and hand-set Jefferson Gothic fits tightly to provide deeper information.